Sales tax may apply when shipping to: IA*, MN*, OH*(7.75%), WA*. 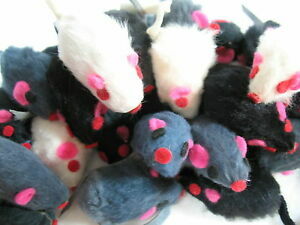 One can never have too many fur mice!!! My cat, Alice, goes around with these in her mouth and talks to them...she also hides them, which is why I have to keep them on hand. These small ones are her favorite and they are very hard to find, even in the specialty pet stores. This was a good value. I would recommend them and definitely reorder. My 12 year old cat jumps in the air again! This toy is too tempting to ignore. It "flys" through the air just like a birds wings. Great toy! It is great that they sell these replacement feathers for it. You don't need to buy a whole new toy. Great value. All the shelter cats loved them! Not much more to say except it made their day. Mice seem to be holding up well for the constant use they are getting. I will be a repeat buyer. Omg my cats go crazy over these !! I bought many different kinds for them and they won't touch them....so if you want to see you cats have a serious amount of try these !!! Don't know what it is about these mice,but from kitten to adult my cats love playing with them. Keep a bunch on hand.